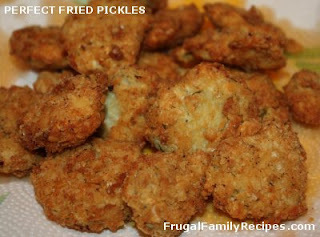 Frugal Family Recipes From BetterBudgeting: Perfect Fried Pickles! Oh my goodness, we love fried pickles! If you haven't had them yet, you're missing a real treat. Especially if you like pickles. 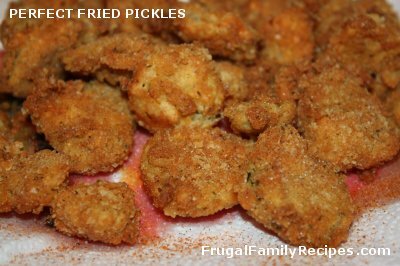 Fried pickles are popular here in the South. The first time we had them was at a barbecue restaurant in 2006; when we moved back home to Atlanta. Ever since then, we've ordered them just about anytime we see them on a menu; splitting one order for our family of 6 means everyone gets just a few. With hubby still out of work we rarely eat out anymore. No more fried pickles. That is... until our college daughter was home for the weekend and said "Mom, let's make fried pickles!" She knows I've been wanting to make them for years so of course I said "Yes, lets do it!" Having had many different types of fried pickles over the last 6 years, we knew there was one type we did NOT want... battered with cornmeal. We also knew they are better fried crispy brown, not too light and not too dark. They should be soft on the inside, crunchy on the outside, and absolutely delicious! I'm happy to report, our homemade fried pickles came out just perfect! Heat oil to 350 degrees. You can use a deep fryer, iron skillet or stockpot on the stove. Mix together flour, salt and pepper, in a large zip bag. 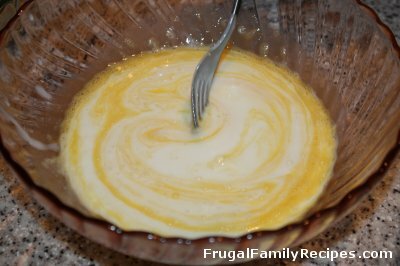 In a medium size bowl or baking dish, mix together eggs and buttermilk. In a third container, preferably a large baking dish, mix together crushed crackers, dill weed and cayenne pepper. 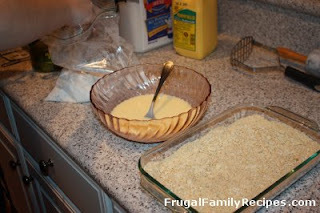 Dip pickles first in flour mixture, then egg mixture, then cracker crumbs. 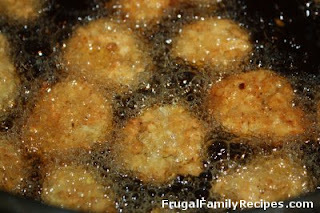 Let them sit on plate for just a bit before placing one at a time into hot oil; small batches of about 10-12 work best. Carefully turn pickles once if necessary to brown evenly on both sides. Remove pickles from oil and drain on paper towels. THEN, sprinkle with a little salt and additional cayenne pepper. OH MY GOODNESS, SO GOOD!!! These are the dill pickle slices (chips) we used. Delicious! 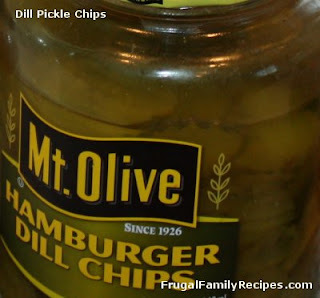 Dill pickle chips are the best type of pickles to use. I would think any brand should be fine, as long as they are fresh. You can also use whole dill pickles and slice them yourself, or pickle spears. Just remember, DILL, not sweet, not bread and butter. There are several methods to crushing the saltine crackers. 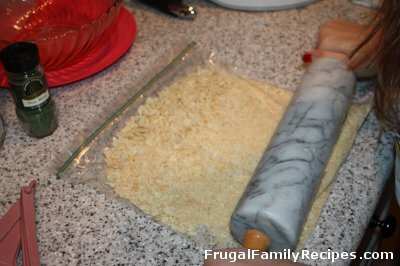 Crush them in a closed zip bag with a rolling pin, in a dish with a potato masher, or pulse them in a food processor. 1st flour, 2nd eggs, 3rd cracker crumbs. 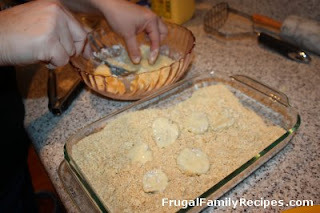 You could also use regular bread crumbs, or panko... just not cornmeal! 350 degree oil, til crispy brown on both sides. Here's what our fried pickles looked like after a sprinkling of additional salt and cayenne pepper. This, I believe, was the ultimate perfect touch!! !